Pastor Paul has built his congregation from modest storefront to shining megachurch with a membership of thousands. But when the beloved minister steps up to the pulpit to share a new belief, his stunning revelation leaves the entire church community rocked to its core. A provocative excavation of modern faith, "The Christians" will feature music from a community choir comprising people from all faiths and backgrounds. A runaway hit of the New York theatre season, this stunningly original play will have all of Atlanta talking. Hallelujah! Finally an Actor’s Express show in which the audience all sits together in one group, and doesn’t have to peer across at other audience members or attempt to peer around the corner of a set. And even more amazing, a show advertised as lasting 90 minutes actually lasts only 90 minutes! Just after announcing that debt has been paid off for the construction of their megachurch, Pastor Paul preaches a sermon espousing an inclusive, hell-free, humanistic theology rather than one based on fire and brimstone. He tells an objecting member of the flock to either conform to this new approach or leave the church. This causes a schism in the church and an immediate defection of 50 members. When a choir member then asks the pastor how she should address questions raised by the pastor’s sermon, he doubles down and asserts that everyone, even murderers, go to heaven. This results in a mass exodus of members. A man who is trying to teach tolerance for others finds that his intolerance in demanding allegiance to this view results in his views not being tolerated. How can it end happily? 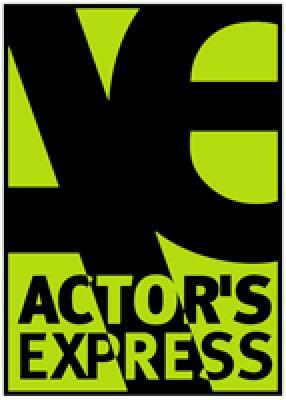 Actor’s Express has recruited a team of regulars to create the visual aspects of the production, which is a bit of a shame. The set, lighting, and costumes all have fairly simple requirements and could have provided opportunities for new designers to break into the stable of professionals working regularly in Atlanta. The set by Isabel & Moriah Curley-Clay has lovely wood flooring and frosted blue, plush carpet that looks just like the front of a church, along with furniture and woodwork molding that give an upscale look. The whole thing is backed by a beautifully colored wall of near-symmetric "stained glass" that for all the world looks like magic marker on backlit paper, with a cheap, but elegantly stained plywood cross in the center. Elizabeth Rasmusson’s costumes consist of Sunday best apparel and choir robes, with the garish suit for Enoch King attempting rather unsuccessfully to single him out as a poorer member of the congregation. Joseph P. Monaghan III’s lighting design features beautifully designed, but somewhat poorly delimited projections that simply scream "church." The sound requirements of the show are very specific, and Actor’s Express newcomer Rob Brooksher does a splendid job of accomplishing them. The organ accompaniment sounds just like a church organ, and the microphones the script demands work flawlessly. Lucas Hnath’s script calls for these microphones to be used throughout, not just for the church service that starts the show, and it’s a bit off-putting in a small theatre, but no more than the small, unison-singing choir we see (musical direction by Allie Lingenfelter) that screams the opposite of a megachurch. Freddie Ashley has blocked the show without a lot of movement, which makes a bedroom scene between the pastor and his wife stand out for its excess of movement. It can’t be realistic, given the demands of the script that all action take place using microphones on a set representing the front of the megachurch, but it seems odd. Mr. Ashley has gotten outstanding performances from all his actors, the choir included. Brian Kurlander has the looks, bearing, and voice of a successful pastor, and expresses the pastor’s convictions convincingly. Kathleen Wattis Kettrey sits silently onstage for much of the show as his supportive wife, reacting with startling naturalism. When she gets to speak, she adds power to this naturalism. Greta M. Glenn reacts nearly as well, and carries off her role with elegant, well-spoken grace. Sarah Newby Halicks triumphs as the Congregant in a single-scene role, but Enoch King, as the Associate, gets to express the most emotion. At the performance I attended, there was applause on Mr. King’s exit, led by a vocal black woman in the audience who seemed to be fervently in favor of the views his character expresses. It was interesting to see the schism in the audience between those cheering him and those sitting silently, in tacit support of the Pastor.